Your awning does a lot for you, from shading your home to providing cover from the elements. It stands there every day and its only job is protect you and the others you bring by to show your awning off to. So, the least you could do is show your awning a little love every now and then. In today’s blog, the Van Nuys Awning Co.®, one of the best custom awning companies in the Los Angeles area, will go over a few things you can do throughout the year to keep your custom awning looking bright, shiny, and new. Pick and choose your favorites or try them all so that your awning looks amazing all year round. If you need further advice, feel free to contact the Van Nuys Awning Co. to answer any questions. 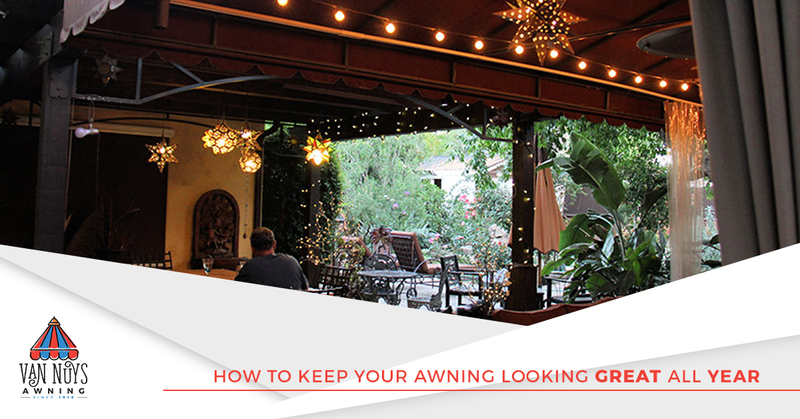 Without further delay, let’s get into the best ways to keep your awning looking great all year. This guide will help with basic awning cleaning, but more thorough tactics may be required to completely remove stains and other harmful chemicals or debris from your awning. If you’re not going to be using your retractable awning for an extended period of time, one of the best things you can do for it is to keep it retracted. This helps keep it still during potentially damaging storms, while also housing it away from falling debris and harmful chemicals. Not only will the life of your retractable awning be extended, the vibrancy and aesthetics will also be given added life. Keeping your awning retracted when not in use will help it last longer and look better. But keep in mind, if you’re extending your awning to clean it, you should wait until it’s completely dry to retract it. Retracting the awning when it’s still wet could damage the gears or other integral features used to make your awning retractable. If you can, allow the fabric and other pieces to become completely dry before retracting any part of your awning. Also be sure that there isn’t any pooled water on your awning’s fabrics to avoid hard water stains and other unsightly messes. Though aluminum awnings come pre-coated with a weatherproof finish and usually have self-lubricating limbs, more care is always welcome to help extend the life of your awning. After winter ends and the beginning of outdoor season begins, clean your awning and wipe it off with a soft towel or shammy. Lubricate the joints with a dry silicone spray lubricant to achieve optimal operations. If you notice cracking around the joints or any stiff gears, those may need a little extra attention with your lubricant to get back to normal. If that dose of lubricant doesn’t seem to work, then it may be time to contact your awning builder for more information or further inspection. Don’t forget to apply lubricant to the crank and all of the gears if you have a retractable awning. We here at the Van Nuys Awning Co. hope you’ve found this blog to be helpful. If you’re looking to get a custom aluminum, wood, or composite awning for your Los Angeles area property, then Van Nuys is ready to help you. Learn more about the Van Nuys Awning Co., view our gallery to see our previous work, or contact Van Nuys to get started on your new project today.